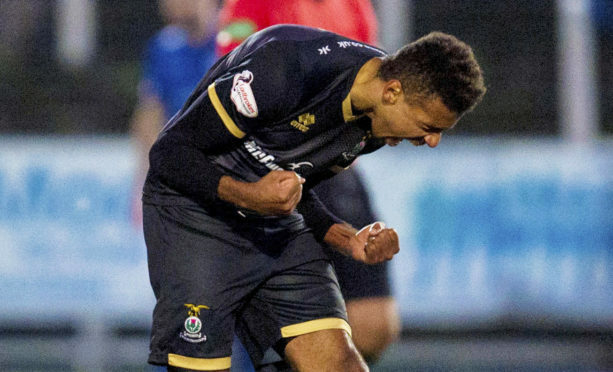 Caley Thistle attacker Nathan Austin is refusing to make any excuses for his lack of starting opportunities for the Highlanders this season. Austin has made just three league starts so far this season, the last of which came in a 2-2 draw at home to Alloa Athletic on August 25, with manager John Robertson having favoured Jordan White in the majority of matches since. Although Austin netted three goals during Inverness’ Betfred Cup group campaign in July, his first Championship strike of the season came as a substitute during Caley Jags’ thrilling 3-3 draw against Queen of the South at Palmerston earlier this month. That earned the 24-year-old a recall to the starting line-up for the 1-1 Scottish Cup draw against Edinburgh City on Sunday, however Austin knows he must maintain his goalscoring form in order to keep his place. Austin said: “I think the fans have maybe been wondering why I’ve not been on as much, but it is because I’ve not been good enough. “Hopefully that goal is the little boost I need. I came on and made an impact – and that’s all I can do. Caley Jags’ focus returns to Championship action when they host Austin’s former club Falkirk on Saturday, with Inverness aiming to extend their unbeaten run of 25 league matches which stretches back to March. The Bairns have struggled this term, with Ray McKinnon’s men two points adrift at the foot of the table with only two victories to their name. Although Austin is proud of the run, the Hertfordshire-born striker says maintaining Caley Jags’ place in the top-four is his most pressing concern. Austin added: “I don’t go into a game thinking about the run. We just take it a game at a time. “We’re here to get into the play-offs at least. It might sound stupid but we’d rather win more games and get beat occasionally, rather than keep drawing and not climb the table. “I don’t think we’re focusing on that unbeaten run as much as other people are. “A lot of the boys in the team are really proud of the long unbeaten run though, especially the defence – they’ve been outstanding.